The Carson-Newman online RN-BSN, online RN-MSN-FNP, online MSN-FNP and online Post-Master’s FNP Certificate programs allow you to earn your degree in a convenient online format with no mandatory class login times, to cater to your busy schedule. The online learning environment promotes a sense of community and connection. You will interact with peers, professors and other faculty members. In the process of earning your degree, you will build a lifelong career network. 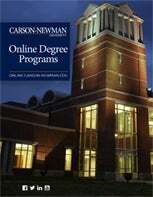 Carson-Newman makes online learning accessible. Materials are available 24/7, and Carson-Newman's faculty is extremely responsive in terms of providing support and real-time feedback to students. Curious what it's like to use our online learning environment? Watch three demo videos below. In addition, online students are matched with a dedicated student success advisor who provides one-on-one guidance from registering for your first class to graduation day. Your student success advisor serves as a personal resource to help round out your learning experience and keep you on track for graduation. Carson-Newman RN-BSN, RN-MSN-FNP, MSN-FNP and Post-Master’s FNP Certificate nurses are taught to use evidence-based practice to make informed decisions about patient care. You will integrate research, clinical expertise and the best evidence available to conduct assessments and provide the most effective care possible. Carson-Newman nursing students are active participants in caring for patients. Carson-Newman RN-BSN, RN-MSN-FNP, MSN-FNP and Post-Master’s FNP Certificate students do more than support recovery – they take a holistic approach to delivering care. RN-BSN graduates provide extra care for patients by promoting a healthy lifestyle and finding resources that positively affect patients’ lives. RN-MSN-FNP, MSN-FNP and Post-Master’s FNP Certificate graduates provide primary care to individuals, families and communities. Ready to get started? Download your Career Brochure Today!